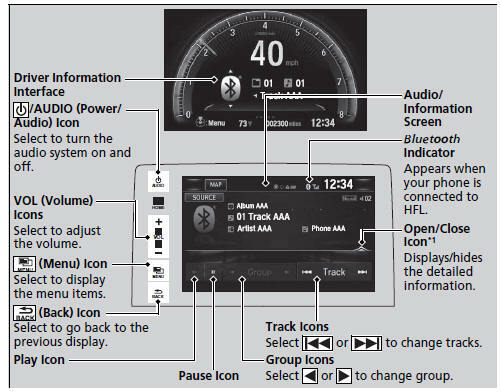 *1:Depending on the Bluetooth’ device you connect, some or all of the lists may not be displayed. Not all Bluetooth-enabled phones with streaming audio capabilities are compatible. To check if your phone is compatible, visit http://www.handsfreelink.com/Honda/. It may be illegal to perform some data device functions while driving. The connected phone for Bluetooth’ Audio can be different. If more than one phone is paired to the HFL system, there may be a delay before the system begins to play. If a phone is currently connected via Apple CarPlay or Android Auto, Bluetooth’ Audio from that phone is unavailable. However, a second previously paired phone can stream Bluetooth’ Audio by selecting Connect from the Bluetooth Device List.